358 pages | 22 B/W Illus. Post-disaster housing concerns and dilemmas are complex, global in nature, and are inextricably intertwined with social, economic, and political considerations. The multi-faceted nature of housing recovery requires a holistic approach that accounts for its numerous dimensions and contours that are best captured with multi-disciplinary, multi-scalar, and multi-hazard approaches. This book serves as a valuable resource by highlighting the key issues and challenges that need to be addressed with regard to post-disaster housing. 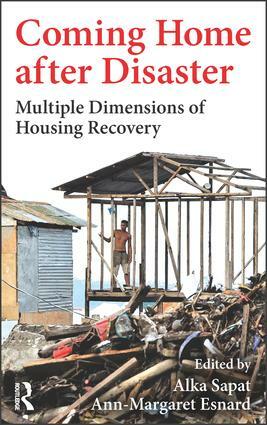 By featuring a collection of case studies on various disasters that have occurred globally and written by scholars and practitioners from various disciplines, it highlights the rich diversity of approaches taken to solve post-disaster housing problems. Coming home after Disaster can serve as an essential reference for researchers and practitioners in disaster and emergency management, public administration, public policy, urban planning, sociology, anthropology, geography, economics, architecture, and other related social science fields. Addresses a wide range of dilemmas such as differential levels of social and physical vulnerability; problems related to land tenure, home-ownership, property rights, planning, and zoning; and political and legal challenges to housing recovery. Discusses the role played by public, private and non-governmental organizations, the informal sector, financial institutions, and insurance in rebuilding and housing recovery. Features global case studies, incorporates relevant examples and policies, and offers solutions from a range of scholars working in multiple disciplines and different countries. Alka Sapat is an associate professor of Public Administration at Florida Atlantic University. Her expertise includes disaster and crisis management, vulnerability and resilience assessment, environmental policy governance, environmental justice, and social network analysis. Ann-Margaret Esnard is a professor of Public Management and Policy in the Andrew Young School of Policy Studies at Georgia State University (GSU). Her expertise encompasses urban planning, disaster planning, hazard and vulnerability assessment, and GIS/spatial analysis. Esnard has been involved in a number of related research initiatives, including National Science Foundation funded projects on topics of population displacement from catastrophic disasters, long-term recovery, and the role of diaspora groups in disasters with transnational impacts.